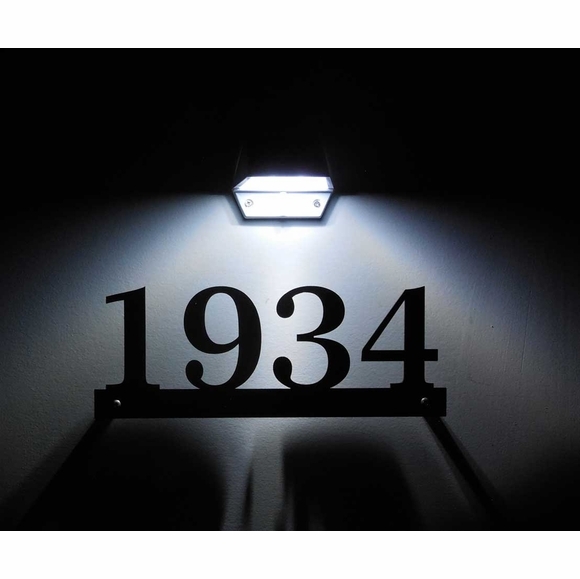 Address Plaque with Floating Numbers and Solar Illumination includes a set of floating sign standoffs that support the sign 1/2" above the wall. A Comfort House exclusive custom made for you. Made in USA. When mounted on a wall with the included nylon standoffs, this floating address sign takes on a vivid 3D appearance. The addition of LED backlighting makes the numbers or letters jump out at you at night. Each standoff has a center hole that is contoured for the supplied long stainless steel Phillips head screw. Cut-out, black silhouette characters (letters or numbers per your customization) seem to float in the air. The characters with their individual profiles are attached to the narrow border (approximately 1" high) at the bottom. This is a one-piece, one-line sign. Holds up to five 3.5" characters. Manufactured of modified, non-rusting acrylic plastic. Approximate dimensions (sign only): 12"W x 4.5"H x 1/8". Final width will depend on number of characters. What's in the box: one floating address plaque with 3/16" mounting holes, stainless steel screws, nylon standoffs, and one solar light. With the supplied standoffs and the background solar illumination powered LEDs, this address plaque is a truly unique location identifier.